A health savings account (HSA) is a tax-advantaged medical savings account accessible to taxpayers in the United States who are registered in a high-deductible health plan (HDHP). The funds contributed to an account are not subject to federal income tax at the time of deposit. This particular plan offers lower premiums and lower taxes for various individuals. Before switching to an HSA plan, however, one would be well advised to seek the counsel of an experienced benefits specialist who is familiar with insurance companies offering high deductible policies that qualify for HSA account participation. In some situations, the lower costs anticipated may not be realized, or may not be worth trade-offs necessary to achieve those savings. 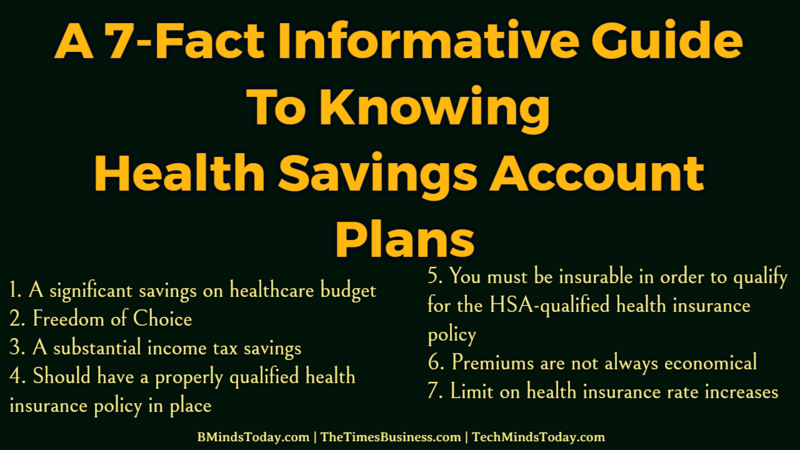 But you should always keep it in mind that the HSA plans are not suitable for every individual. In order to make a decision pertaining to HAS plans, you should consider the following factors so that you will have a clear understanding whether an HSA will benefit you and your family. An HSA plan can cut healthcare budgets by an average of 40% for many individuals. However, some people will not realize any net savings. Those most likely to realize significant savings are people who pay all of their own health insurance premiums, such as the self-employed, who are relatively healthy with few medical expenses. A health savings plan reestablishes freedom of choice. An HSA plan has a feature that basically puts individual consumers back in govern of their own health care. It means every individual ought to be more answerable for his/her own health care choices. This particular method of self-reliance is not at all times suitable for everyone, specifically those who have become comfortable with Health Maintenance Organization (HMO) type “co-pay” plans. Health savings accounts minimize income taxes. The money paid into your HSA account is subtracted from your taxable income in the similar way as contributions into a traditional Individual Retirement Account. In several cases, new account holders are able to almost fully fund their HSA with money saved on premiums from a prior, higher priced plan. By storing all or most of those savings into an HSA, the account holder realizes instant, additional savings in the form of reduced taxes. You must have a properly qualified high health insurance policy in place first before you can open a health savings account. The key fallacy regarding HSA plans is that any insurance policy with a high deductible will qualify the policyholder to establish an HSA account. Not simply any policy with “high deductible” will serve, as the regulations are quite detailed in this regard. Prior to taking a decision it is important to be sure that you are insured under a suitably qualified policy. To get a knowledgeable information regarding HAS plans, you better discuss the choices work a qualified and duly licensed health insurance broker. Since many people do not have a suitably qualified high deductible insurance policy, they will need to switch insurance plans in order to become HSA-eligible. Unless coverage is being offered under small group reform regulations, the new high deductible policy will be individually backed by an insurance company. This means that some “pre-existing” conditions may not be completely covered. On the other hand, some firms in the market offer policies to cover certain “pre-existing” conditions in exchange for higher premiums. Remember that you should not switch to an HSA plan when the Management of existing medical expenses is more important than saving up-front medical insurance premiums. You should not change health plan in following scenarios. If any family member is pregnant. Usually, it is moderately stress-free to meet the requirements. In some cases, medical records may be requested. Although HSA insurance premiums are low, they are not always as low as you might expect. This mostly happens for one focal reason. Basically specified, the underlying insurance policy is just that—a health insurance policy. Even though it has a “high” deductible, as required by regulation, the insurance firm still should need to pay for the risk it is assuming over the deductible amount, which it actually processes by collecting premiums. There are several insurance firms out there in the market that offer policies with “one deductible” approach. That means all the members in the family can be part of this particular policy. With these sorts of plans, it is not unusual for premiums for a 5000-family deductible with 100% coverage after the deductible to be comparable to a 2500 “per member” deductible plan with 80/20 coverage after the deductible. Lower premiums signify just one component of the lower net cost achieved with an HSA plan. The low net cost of an HSA plan is achieved after factoring in the benefits of lower taxes, made possible by the tax-deductible contribution to the HSA account. Therefore, if finding the lowest possible gross premium is your core apprehension, you may wish to consider a high deductible, non-HSA policy, especially if you do not see the use to contributing to a tax-deductible savings account. An HSA offers your best chance to keep a cap on health insurance rate increases. Make no mistake-you will have rate increases with your HSA insurance policy. For the reason that an HSA qualified policy is still a health insurance policy at core, there is no sound reason to assume that an HSA policy would be immune to rate increases required by an insurer to keep paying claims and stay in business. Then what you can expect is that the actual amount of any future rate increases will be significantly lower compared to traditional health insurance plans. This is actually right because insurers base increases on percentages, and the same percentage of a lower base premium results in a lower amount increase. It may be an imperfect solution for many individuals but considering several factors it is the most cost-efficient approach for several qualified persons. This information is for Learning purposes only. We are indeed not financial/legal/health mentors. It should not be considered legal or financial or health advice. You should consult with a financial/legal/health advisor or other professional to find out what may be the optimum for your individual needs.